WASHINGTON— As allegations of sexual assault and harassment toppled other powerful men, Donald Trump denied his way into America’s highest office. Trump’s pick for a critical U.S. Supreme Court seat, Brett Kavanaugh, will now try to ride his own denial onto America’s highest bench. And Republicans will try for the second consecutive election to avoid a furious backlash from American women. 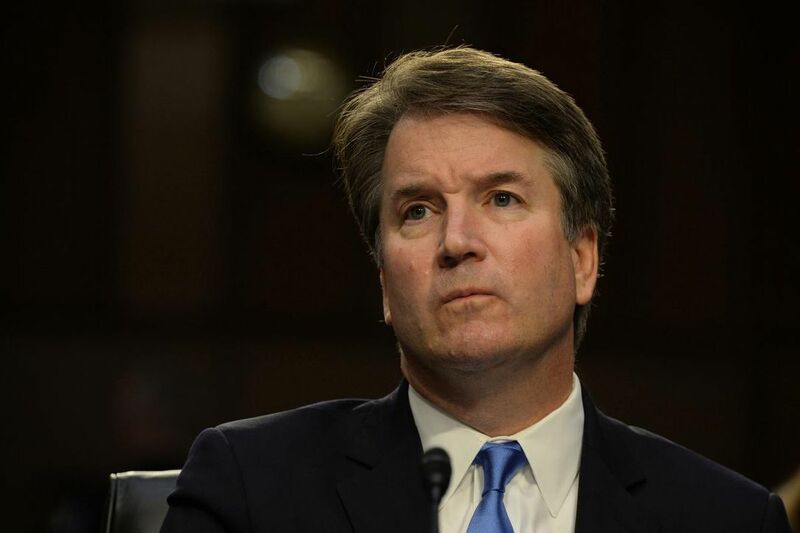 Kavanaugh’s confirmation has been thrown into doubt by a claim from California psychology professor Christine Blasey Ford that Kavanaugh sexually assaulted her in 1982, when they were teenagers in Maryland, by pinning her to a bed, groping her and putting his hand over her mouth. Kavanaugh says he has never done any such thing. Trump, who has consistently taken the side of accused men, says he feels “terribly” for him. Democrats say they believe her. The high-stakes credibility battle, waged until now as a proxy war between friends and allies of Kavanaugh and Blasey Ford, may next week become a televised one-against-one showdown. Blasey Ford and Kavanaugh have been invited to testify at a Senate Judiciary Committee hearing. After initially suggesting she wanted the FBI to conduct an investigation before she testified, Blasey Ford’s lawyer suggested Thursday that she would be willing to testify next week without an investigation. The lawyer said Blasey Ford would only testify on a day later than Monday, and only on “terms that are fair and which ensure her safety,” the New York Times reported. A hearing would pose significant danger not only for Kavanaugh but for Republicans, said Rick Tyler, a MSNBC political analyst and former senior aide to Republican senator Ted Cruz. The hearing would come just a month and a half before the critical congressional midterm elections — and 27 years after the hearing in which lawyer Anita Hill testified that another Republican nominee for the court, Clarence Thomas, had sexually harassed her. Hill’s testimony failed to persuade senators to reject Thomas, but it had long-lasting consequences. Male Republican committee members’ hostile questioning of Hill, and male Democrats’ failure to mount a vigorous defence, helped produce the next year’s “Year of the Woman,” a surge of female political energy in which four Democratic women were elected to a Senate that previously had only two female members. “Even while the hearings were happening with Anita Hill, the majority of the American public did not believe her. The majority of the public was still outraged at her treatment,” said Amy Richards, co-editor of the 2012 book I Still Believe Anita Hill. The Kavanaugh situation may be even more precarious for Republicans. Unlike Thomas, whose confirmation was heavily favoured by voters, the public is divided on Kavanaugh. Even before the accusations came to light, Kavanaugh enjoyed less support than any court nominee since the 1980s. The national conversation inspired in part by Hill’s testimony has significantly lowered public tolerance for male sexual wrongdoing. The public has seen dozens of other high-profile men recently lose jobs as a result of the #MeToo movement. Republicans are already struggling to overcome a severe gender gap. In one poll this month, women favoured Democrats over Republicans by a whopping 20 points, 55 per cent to 35 per cent. The Kavanaugh controversy focuses attention on Trump’s own past of sexism and alleged assault. And the Judiciary Committee, all white and all male in 1991, has gotten more diverse only on the Democratic side. All of the Republicans are male, including chairman Chuck Grassley and Orrin Hatch, who were on the panel that interrogated Hill. As of now, public views appear to be split on partisan lines. A HuffPost/YouGov poll found just 4 per cent of Trump voters found the allegations credible, versus 62 per cent of Clinton voters. The Republicans appear aware of the potential for bad optics at a hearing. According to the Times, the Republicans are looking to hire an independent lawyer to question Blasey Ford rather than doing it themselves. Trump has offered effusive praise of Kavanaugh, calling him an “outstanding man,” and said it would be “very hard” to imagine that Blasey Ford is telling the truth. But he has acknowledged that her appearance could put him in a difficult position. “Look, if she shows up and makes a credible showing, that will be very interesting, and we’ll have to make a decision,” he said Wednesday. If Kavanaugh is defeated in a Senate vote or if he withdraws his candidacy, Trump would nominate someone else.